If you live in the South Bronx and you’ve been feeling hot and bothered, you’re not alone. 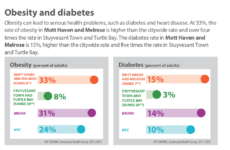 It comes as no surprise for residents of Mott Haven and Hunts Point to learn their neighborhoods are among the city’s toughest in which to endure the hot summer months, according to a recent report by the Department of Health. In all, the DOH rates 12 city neighborhoods five out of five, meaning residents there are at the highest risk of heat-related illness, on its new heat vulnerability index. Half of those 12 are in the Bronx. Heat-related illnesses occur when the body cannot cool down. This extra stress can worsen other health conditions, such as heart and lung disease. 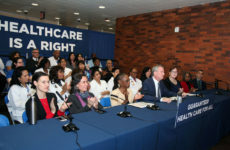 New Yorkers without air conditioning and those 65 years and older, or with chronic medical conditions, are at highest risk. Heat stroke, which occurs when the body’s temperature rises quickly, can rapidly lead to death. Complicating matters, many low-income residents who own air conditioners don’t use them even in extreme heat, in order to cut down on electric bills. 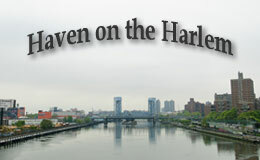 Mott Haven’s median household income of $20,334, and Melrose’s, which is $26,339, are among the city’s lowest, meaning that regularly running an air conditioner is not always an option for most. “Right now, I couldn’t afford one,” said Janette Moye, 76, who lives in Melrose Houses. “But I have to get one because this is crazy.” Moye, who suffers from heart disease, said she had spent part of that 90-degree early August afternoon outside, against her doctor’s advice. She said she was having trouble breathing that day, as was her granddaughter, who suffers from asthma. “I have to wait for the sun to go down whenever I want to go to the bodega or the supermarket,” said Rosa Garcia, 66, who has lived in Andrew Jackson Houses for 30 years. Garcia, who has high blood pressure and recently underwent eye surgery, has a hard time getting around. She keeps her air conditioner on despite the expense, and doesn’t dare venture outside on those extra hot summer afternoons. Even many who own air conditioners said they use fans instead, to bring down electric bills. 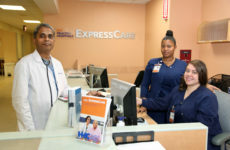 But Dr. Bala Kanna, deputy medical director at Lincoln Medical Center, suggests residents instead set their air conditioners at 78, or go to a public cooling center, because fans alone are rarely enough relief for those with health conditions during one of the city’s punishing heat waves. In order to avoid heat illness, Dr. Kanna advises residents to watch out for the following warning signs: Heavy sweating, muscle cramps, light-headedness, feeling faint, headache, decreased energy, loss of appetite and nausea. Signs of heat illness include skin that is hot and dry or cold and clammy, confusion, disorientation, nausea or vomiting, and dizziness. 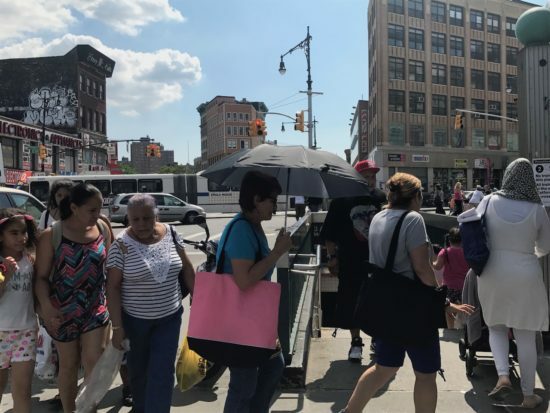 The health department says it hopes the heat vulnerability index will nudge other city agencies to take direct action in at-risk neighborhoods like the South Bronx, by intensifying outreach and planting lots more trees. In addition, the “Be A Buddy” program, which the mayor implemented in June, aims to curb the effects of extended heat waves by creating volunteer-based community networks to watch out for vulnerable neighbors. And the DOH recommends people get to know their elderly neighbors so they can help when emergencies strike.